The contemporary, Darwinian view from the fields of biology and anthropology holds that the appearance of life on Earth was driven by chance from the molecular level up, then adapted over time to survive better in a hostile environment. Indeed, the theory of evolution depends exclusively on natural selection and “survival of the fittest” (with the occasional, random mutation) to explain the shapes of the tiniest plants and organisms up to the largest animal. Counter to this is the belief in “Creationism” or “Intelligent Design”, whose proponents claim life was created by divine intervention (perhaps only a few thousand years ago) without need of any organic process on Earth. Considered by most scientists to be a blatant disregard or misreading of the archeological evidence to serve religious purposes, its popularity reveals a deep-seated desire by many to find meaning and purpose in a seemingly random universe. As things stand today, “Evolution” and “Intelligent Design” are the only explanations we have for life on Earth. Without a better explanation, most scientific-minded people choose Darwin’s theory as it is, defending it without question in spite of the fact that it cannot tell us, for instance, why we have five fingers instead of six, or a wave-like spine rather than a straight one. Everyone knows instinctively that something is missing in evolutionary theory to answer such questions, but what could it be? Consider the possibility of a third explanation – one compatible with evolution but leaving the door open for a spiritual connection. What if there is a less obvious but universal property in Nature that physically guides evolution from somewhere beneath the environmental process of natural selection to carve the basic shapes of life? As radical as it may sound to modern ears, there are a number of good reasons why this may be the case. Common sense alone tells us that for natural selection to be the only explanation for why life appears as it does, the fossil record should show many times the variations found. For instance, since eight legs work so well for a spider, shouldn’t we find fossils of higher organisms with eight legs capable of out-running, out-maneuvering and even out-boxing their four-legged predators? Or how about only three legs, which might have enabled a more efficient cardiovascular system? Where are all the animal fossils with entirely different appendages, re-arranged internal organs, extra joints that offer greater flexibility or even eyes in the back of their heads? Wouldn’t some of these have been more survivable than many animals today? Yet, for some unexplained reason, fish, reptiles, amphibians, birds, mammals and even dinosaurs all ended up with the same basic, skeletal structure consisting of a wave-like spine, cardioid-shaped rib cage, single head and four limbs. While natural selection does imbue each of these creatures with a particular anatomical variation or morphology, this basic, 5-fold archetype was the one and only internal, skeletal template that emerged. Similarly, insects are a morphological adaptation of a single, 3-fold exo-skeleton template comprising a head, thorax and abdomen. These, too, appear to have occurred during the transition to land and air from simpler sea creatures (from an evolutionary point of view). As for invertebrates like jellyfish, all the way down to bacteria and viruses, all manifest a morphology of simple, periodic geometries, such as spheres, rings, toruses, tubes, helixes, stars and even icosahedrons. Plants and fungi are much the same, branching or spiraling as groups of about 62% and 38% into the extruded, regular geometries of fruits, vegetables and flowers. 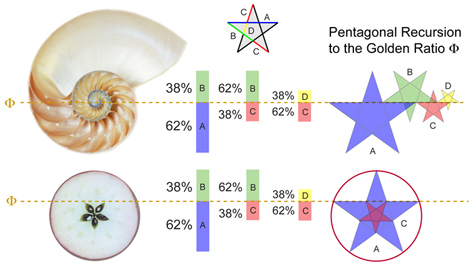 Pentagonal geometry of life: upper line shows the golden spiral of a Nautilus pompilius converging to the square root of 5; lower line indicates the inner seed geometry of an apple growing according to the same pentagonal recursion. But for natural selection to favour survivability, shouldn’t we expect to see fossils of plants that once branched randomly (or equally) or land animals with much more diverse features? Shouldn’t the animals alive today have descended from more efficient and fiercely competitive, anatomical archetypes? The fact is, there is nothing in the theory of evolution and the fossil record that can explain any of this, any more than it can explain why leaves are not square or why fruit is not in the form of, say, randomized, irregular blobs. So, what else could be at work to guide the evolution of life? All life on Earth is composed mostly of carbon-12 and water. This is the case because carbon-12 bonds or resonates with more simple elements than any other element in the universe. It is for this very reason that carbon-12 is the international standard for atomic weight and all other elements are measured against it. With 6 protons + 6 neutrons in its nucleus and 6 electrons orbiting in two shells, carbon-12 exhibits the lowest possible energy of all the elements and is said to be “unbound”, thereby creating the most stable, atomic geometry possible. When mixed with water, carbon-12 creates endless chains of “sticky” amino acids capable of crystallizing into life. 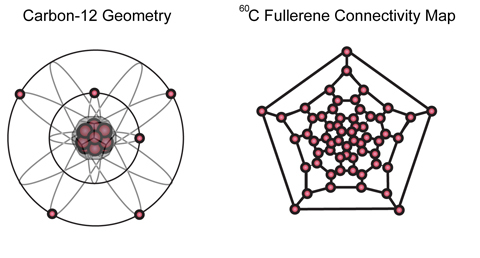 Carbon-60 Fullerene geometry is a result of the truncated icosahedral packing and spacing of carbon atoms in a cage. This idea of life as a crystallization process is a good one because just as minerals align under pressure into lattices, coils of amino acids fold under pressure into three-dimensional, protein structures, aligning into the familiar helical lattice of DNA. It is the geometric pressure of hydrogen atoms in water that helps create the lattice and give DNA its twist. In recent molecular studies of water, biochemist Martin Chaplin found that water organizes itself naturally into a lattice of icosahedral clusters, just as Greek philosopher Plato suggested more than two millennia ago. Water really does resemble the 12-pointed, 20-faceted geometry of an icosahedron. The water lattice begins as 4-fold, tetrahedral units of 14 water molecules, aligning into 20 clusters to create the geometry of a 280-molecule, water icosahedron. This structure then assumes a variety of stable, geometric sub-structures, such as its complementary, opposite dodecahedron, that form into even larger “superclusters”. At this mesoscopic scale of water, molecules arrange themselves into a 2-dimensional, connectivity map of a regular, 5-fold pentagon. Water’s molecular geometry begins as interlocking tetrahedrons of water molecules that combine into icosahedral clusters and pentagonal superclusters at the mesoscopic scale. When the 5-fold icosahedral geometry of water is then combined with the complementary, dodecahedral geometry of carbon-12, something very interesting occurs – they resonate with one another to produce the characteristic 12 by 5 geometry of life. There is nothing random or arbitrary about this – it is an inevitable outcome of the physics of harmonics acting at the atomic level. Carbon vibrates or resonates with it self and other simple elements while water acts to deaden or “damp” everything into a pentagonal framework. The role of atomic resonance was demonstrated in another recent study showing how the first step of enclosure needed for a living cell results from the geometrical folding of carbon molecules. In a 2006 publication of the American Chemical Society entitled, Tb3N@C84: An Improbable, Egg-Shaped Endohedral Fullerene that Violates the Isolated Pentagon Rule, it was reported that a large, Fullerene, carbon-84 allotrope constructed its own egg-like cage when two adjacent pentagons in the carbon molecule became fused together in a reaction with terbium. Endohedral carbon-84 Fullerene Egg shown warping into the quasi-crystal geometry of a common hen’s egg. Discovered by a combined team from the University of California, Virginia Polytechnic and Emory and Henry College, this was the first indication that the regular, soccer ball geometry of hexagons and pentagons in a large, carbon Fullerene could wrap itself into an egg-like cage by reacting with another atom, thereby producing a uniquely organic geometry known as a quasi-crystal. This discovery could answer a lot of questions. For one thing, it tells us that it was the egg that came before the chicken. Seriously, this is how amino acids could have ‘learned’ to form cells around themselves to protect themselves from a hostile environment. It could even offer a reasonable explanation for how ribcages came to form around vital organs in all vertebrate animals. It shows how the harmonic balance between pentagonal and hexagonal molecular geometry begins the self-organizing enclosure process of life. 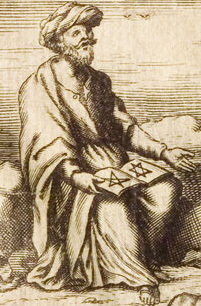 This little image is a detail from the larger image. Look, what’s written in the book? A pentagram and hexagram. (Wisdom for those who have eyes to see). In each of these studies, we can begin to see how evolution is guided by geometric harmonies at the mesoscopic scale of carbon-water bonding. The 5-fold, ‘inward-damping’ geometry of water is really just a pressurized container for the ‘outward-explosion’ of carbon-12 atoms, resonating together into living, harmonic crystals from in-animate matter. The entire process could be described as a kind of biological music using a finely tuned keyboard framework made of water and carbon atoms. For example, musical scales usually divide a circular octave into 12 steps called semi-tones. 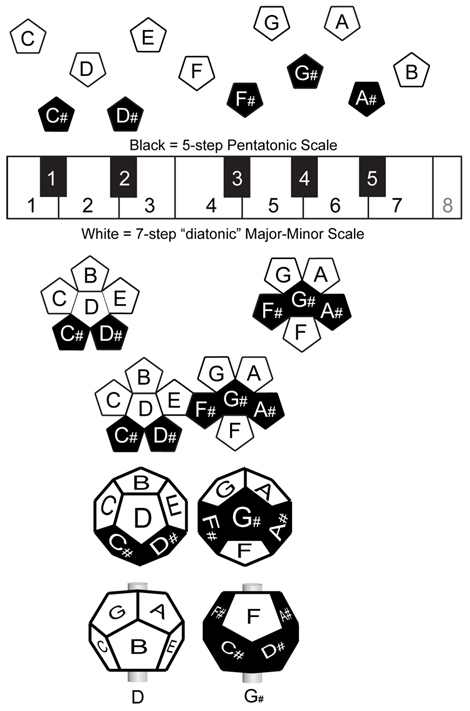 This 12-step octave is then divided into two scalar groupings – one 7-tone, major or minor scale and a remaining 5-tone, pentatonic scale. On a piano keyboard, these appear as the seven white keys of a C major (or A minor) scale and five black keys of an F sharp, pentatonic scale. 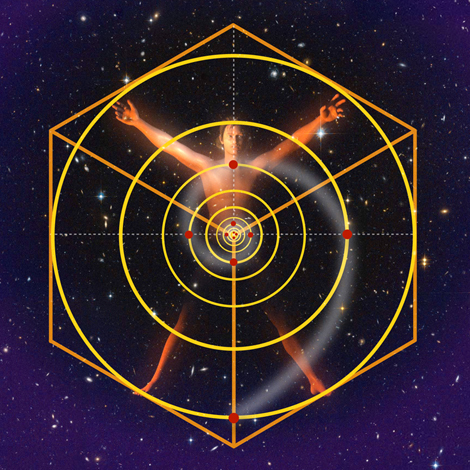 When applied to the human body, life can be described in musical terms as a repeating, carbon-12 octave resonating against the pentatonic, damping geometry of water, thus creating the twisting, 7-step, “diatonic” framework of our body. It is no coincidence that the musical term ‘diatonic’ means ‘through the body’ and that the ancient, Hindu, chakra system indicates seven locations in the body; this is really a very old idea. Dodecahedral geometry of the musical octave as a universal model for carbon-water bonding. The theory that life grows as a kind of musical geometry has provenance with Pythagoras at least 2,500 years ago. Known as “Musica Universalis” (or, in the body, as Musica Humana), it was the ancient world’s “Theory of Everything”. Discarded long ago by Western science and abandoned in our schools, we are now finding solid evidence to support the idea that “Musica Universalis” could well be true. Life really does appear to be a kind of biological music bubbling up from the underworld of atomic structure. From the perspective of atomic resonance, Darwinian evolution can now be seen as a veneer of adaptation that depends on a pre-existing and universal, harmonic system intrinsic to all Nature. 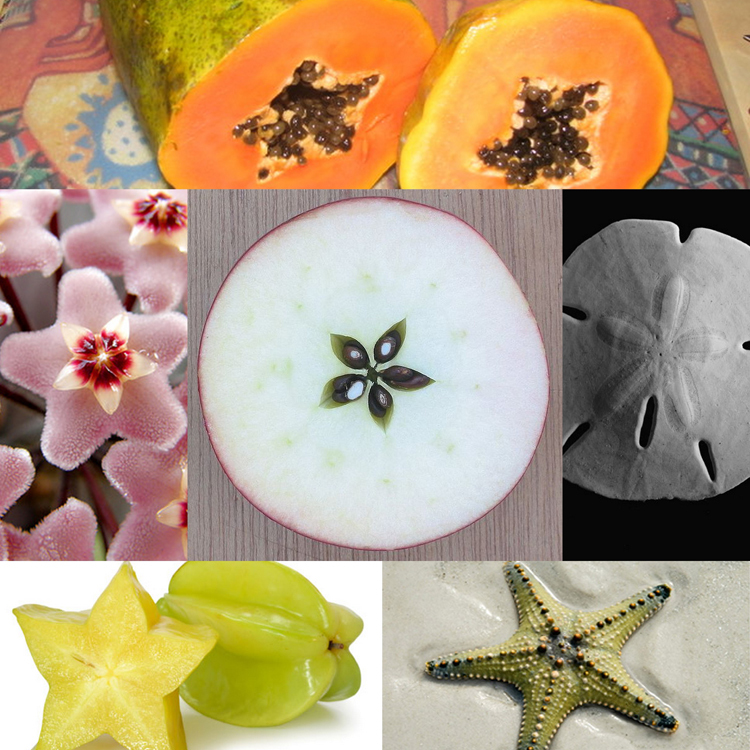 Simple life resonates into uni-body and 3-fold, carbon-12 shapes, while more complex forms succumb to the 5-fold, damping effect of water, branching out at approximated, Golden Sections into pentagonal clusters, such as roses, starfish and the human anatomy. As the most resonant life form of all, we humans exist at the razor’s edge of atomic harmony, perfectly balanced by Nature to achieve consciousness and ponder our own existence. A recent paper by physician and independent researcher Mark White, entitled The G-ball, a New Icon for codon symmetry and the Genetic Code, proposed that the codon table of the genetic code follows the shape of a 12:5 dodecahedron or 20:12 icosahedron. Since there are exactly four nucleotides in DNA that combine in sequences of three to produce 64 codons, White suggested that the genetic code organizes itself into the shape of tetrahedrons, which then combine into the shape of a spherical dodecahedron or icosahedron – exactly like clusters of water molecules. Following the equilateral genetic structure predicted by Russian physicist and cosmologist George Gamow, White explains how the 20 edges of a dodecahedron (or 20 triangular faces of its dual icosahedron) can be used to represent the 20 standard amino acids in DNA. The amino acids are then assigned locations in the geometry according to their water affinity (how much they like or dislike water). Mark White’s “G-Ball” DNA dodecahedron model showing the 20 standard amino acids organized in space according to water affinity. From this, protein bonds into sequences of amino acid tetrahedrons, forming into a 12-sided, dodecahedral framework that is then twisted by hydrogen around a fixed polar back-bone to produce the 10-step, spatial symmetry of the DNA double helix. 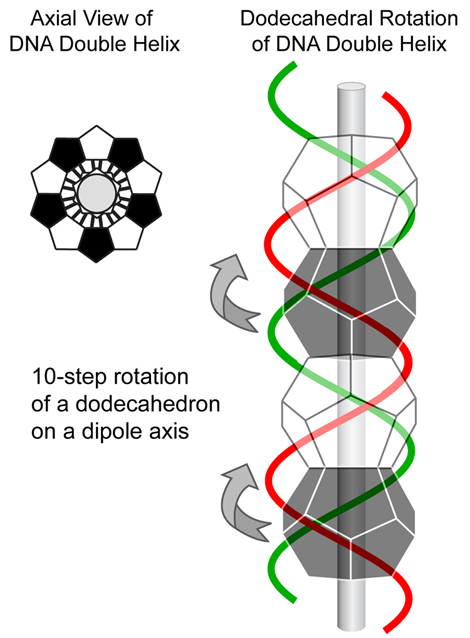 DNA double helix modeled as a dodecahedron rotated around a central axis. Another study by Chi Ming Yang at Nankai University in China claims to have also found a quasi-periodic, egg geometry in the human genetic code, paralleling Mark White’s G-Ball model. Derived from the same building blocks of 20 standard amino acids and 64 tri-nucleotide codons in DNA, Yang found a cooperative, “vector-in-space” addition principle that stretches into an ellipsoid or egg-like shape called an icosikaioctagon. So, when we combine Yang’s geometric model with White’s G-ball model, we arrive at the universal archetype for all life – a 5-fold “egg” with a 12-fold “yolk” inside. While the idea that DNA is encoded geometrically as a 5-fold egg may be surprising, this knowledge appears to predate even Pythagoras. 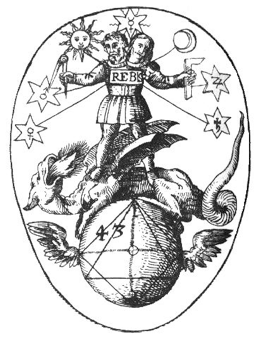 As a symbol of balance in all life, early natural philosophers understood the egg as an instance of the Golden Mean – cubed in its length and doubled in its width – and thus derived from the square root of 5 in a pentagram. 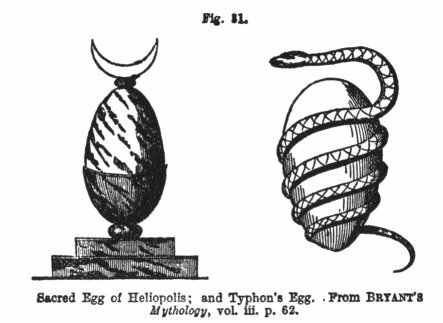 As example, Aesop’s fable of “The Goose That Laid the Golden Eggs”, based on a much older, Egyptian story, probably has more to do with how life grows harmonically inside a golden-proportioned egg than it does with precious metal. In an ancient worldview founded on the physics of music, the 5-fold, pentatonic eggshell could have been seen as a container for the 12-fold, octave yolk, creating the 7-fold, diatonic balance of life in the space between. But even with growing evidence for harmonic structures in DNA, one last puzzle remains to be solved to fully understand how atomic resonance guides so called “evolution”. In particular, how do carbon and water atoms “know” how to arrange themselves into larger, harmonic structures? And while resonance in amino acids appears to start the crystallization process at the mesoscopic level of water and carbon, what appears to cause this to continue outward into the macro structures of highly evolved organisms? It is a well-known fact that sound will produce regular, geometric patterns when particles of powder are vibrated on plates or inside liquid containers. Known as cymatics (from the Greek for “wave”). 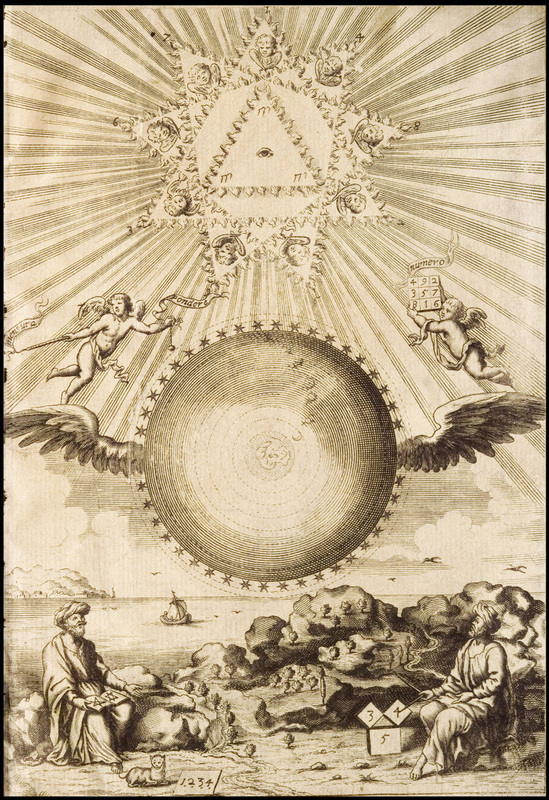 Researchers such as Ernst Chladni in the 18th century and Hans Jenny in the 20th have shown how harmonic waves reflect inside containers to form circles, triangles, pentagons, hexagons and other, more elaborate, mandala-like patterns. Cymatic resonance patterns in a circular container of water show how harmonics interfere to produce regular geometries. These patterns are produced by stable standing waves reflecting inside a container, automatically forming additional harmonic waves that interfere geometrically. It is really the harmonics that “know” how to create cymatic geometry by simply crossing one another at whole number proportions. The same thing appears to happen between atoms and in DNA as harmonics guide the formation of life, with the only difference being space itself as the “golden egg” container. According to quantum theory, space is not actually an empty void but, rather, a very fine, cubic lattice of tiny vortices, often described as a Schwarzschild lattice. Within this structured space, atoms are said always to centre around one of these spiraling vortices inside a given cube of the lattice. Since atoms can only exist inside one of these cubes at a time, all material objects – including everything from planets to people – must blink on and off in tiny “quantum steps” as they move through space. Light and other electromagnetic energy also blinks on and off, but is able to flow freely as alternating currents in between these cubes in the lattice by spinning off the edges (or event horizons) of the atomic vortices. This theory is used to explain how X-rays and cosmic rays are able to pass right through solid objects. So, when we now consider carbon and water atoms resonating together inside the container of the quantum Schwarzschild lattice – pressurized into spherical bubbles by gravity – the atoms and molecules in living tissue would naturally entrain and resonate together into larger and larger cymatic patterns, exactly like powder vibrated inside a spherical, water container. For life, it is the cubic structure of space and the pressure of its gravitational “egg” that together have the “know how” to arrange vast numbers of harmonically resonating molecules into life-size, crystalline structures. In the human body, resonating atoms, molecules and cells have little choice but to “intelligently” self-organize into the 24 vertebrae of our spinal column, rippling outward with less and less energy to the tips of our 10 fingers and 10 toes. Here again we find the body described as a (24/10) / 2 or 12:5 carbon-water crystal resonating into the cymatic container of the quantum lattice. It is not a matter of metaphysics to say that life is frozen, musical light formed by spherical harmonics in a structured space. 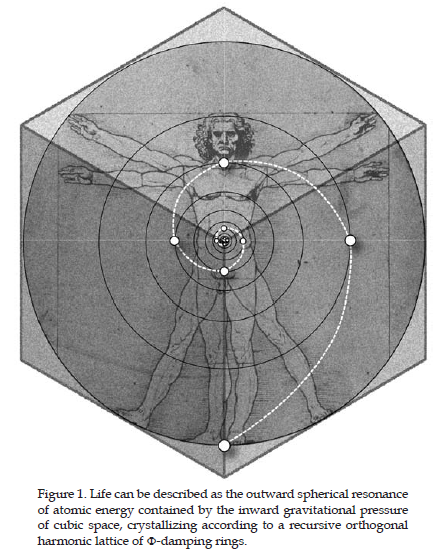 Life was not only guided harmonically from the inside-out but also from the outside-in. The outside-in resonance of our solar system set the stage on Earth for the inside-out, atomic resonance of carbon-12, meeting in the middle waters of Earth to create the balance needed for life and consciousness to evolve. Resonating standing waves like this work in the same way at every scale of Nature – large and small, in-animate and animate – to guide the geometric crystallization of energy into the material forms of planets, plants, pets and people. Yet today, this musical theory of everything is nowhere to be found. The harmonic models of Nature no longer guide our understanding of how things came to be as they are or what their purpose might be. Instead, evolution & natural selection are the main reasons we give ourselves to explain the magnificent order and beauty we see around us, reasons and viewpoints that completely ignore the central role harmonics plays in all manifestations of the physical world. If mankind is to survive within a universe of natural laws, the truth of harmonic guidance must be re-discovered and accepted. Once it is, the walls between biology, anthropology, psychology, acoustics, physics and all other fields of science will come tumbling down like the Berlin wall. Life will be seen as part of a whole and harmonically unified universe, falling under the purview of harmonic philosophy and quantum physics. The quantum effects of subatomic, harmonic systems will become central to all biological and medical research, leading the world toward any number of un-imaginable, scientific advancements. And as society’s thinking shifts, Western religion will change too, transforming into great temples of natural learning. The study of sacred geometry and musical proportions will once again infuse our culture with a respect and appreciation for Nature. Everyone from the staunchest atheist to the most dogmatic fundamentalist will no longer deny the truth of a coherent, musical universe. Today’s conventional wisdom that “restarting life on Earth (or another planet) would turn out completely different” would be replaced by a deeper understanding that 12:5 geometry is as much a universal constant as the circular resonance of Pi or the square, damping action of the Golden Ratio, woven into the very fabric of space itself. Special Thanks to “Richard Merrik”.